Uncle Herm’s phone number hasn’t changed in sixty-some years. The ten digits are rooted in my childhood. Should I ever forget them, the end of my productive life is nigh. Until a decade ago, his phone number first connected me to Aunt Dean, his beloved wife. It seemed he felt awkward talking to a phone. 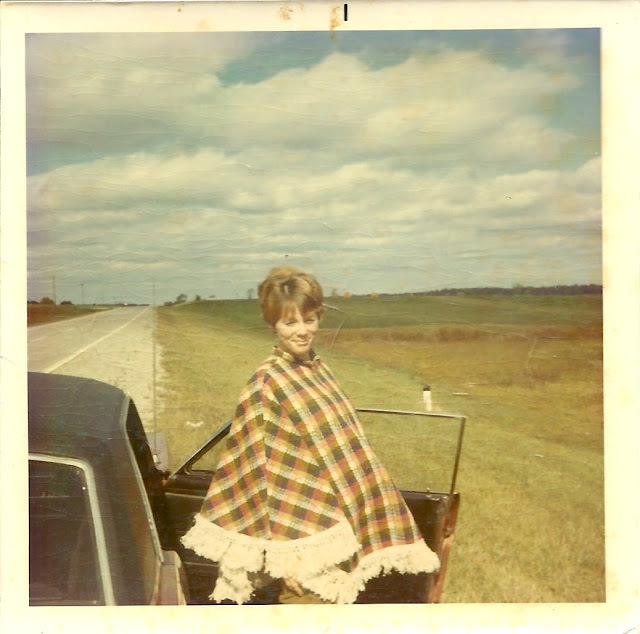 Of Mom’s five daughters, I was my aunt and uncle’s “pick”, the term Southerners use for their favorite people, places, and things. According to Uncle Herm’s account, this affection began the night of my nativity. As he rounded the mountain on foot in pitch dark after courting Aunt Dean, he saw lights in our homeplace. Dad backed the car out of the garage. Uncle Herm opened the door for Mom. “Get in the backseat, Herm,” Dad said. I dial Uncle Herm and regret again the loss of my hardwired landline to WIFI. I listen for his voice—my anchor to the world I once knew. I sing “Happy Birthday to You” with all my heart. His fellow senior center cronies tipped him off about the doctor asking him to count back from twenty to one. The last patriarch with accurate memory, Herman Glen McCoy lists the names and dates of the children his parents begot. The most grievous of all stories are the deaths of two babies who preceded his birth, his sister Sarah Jane’s death, and the mining accident that crippled his father in 1933. “He paid for his brother’s degree while raising a family?” I ask in wonder. Long and short memory in tact, he tells me that he replaced the back and front brakes on his daughter’s car this week. Dear Reader, with each conversation, my uncle imparts a portion of his resilience to my spirit. I determine again to sustain my old phone number—to write until I cannot remember how to count from twenty to one. At heart, I am not a modern woman. We met the Jouet sisters and their father in early May 1995. 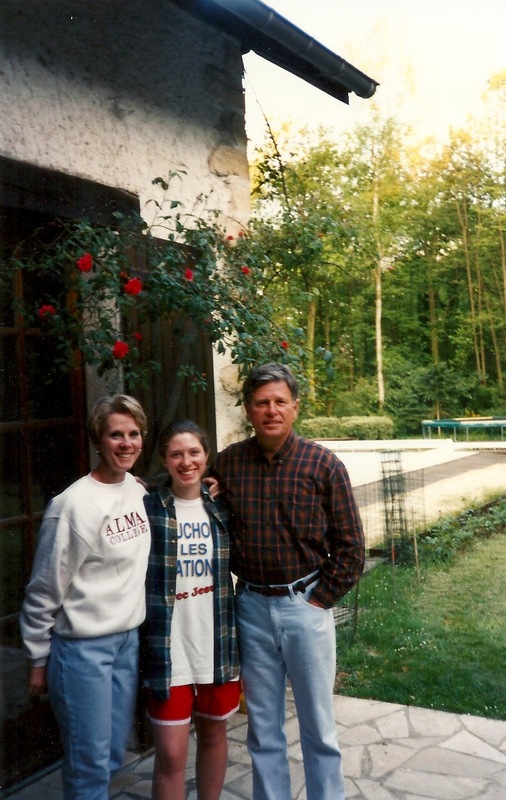 They hosted Kelly, our middle daughter, while a student of the Alliance Francaise in Paris. The spring of our twenty-fifth wedding anniversary, Kelly met us at the Paris train station. A dream come true. Commuters carried home boughs of nodding lilacs. A gardener, I thought it a lovely tradition. She led us to the Jouet’s door located in a small hamlet outside the city. Marie-Aline and Fifi, the family’s German shepherd, welcomed us. “Would you like something to eat?” Marie-Aline said in beautiful English. The kitchen fascinated me. The stove’s large, hospitable size seemed eager for company. At their table I learned a few French foodways: they kept baguettes in a basket, and spooned black currant preserves and Nutella on their bread. 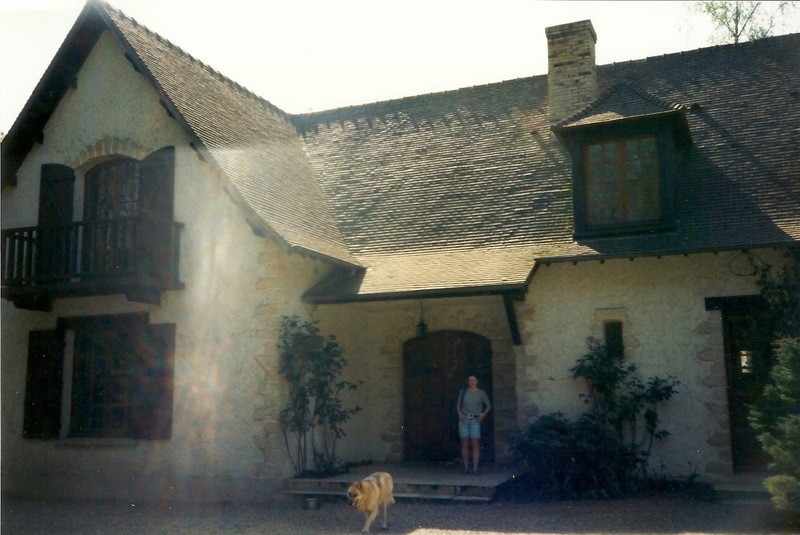 Marie-Aline offered a tour of the house. The spacious living room accommodated meetings for a local Christian youth group. Yes, the Jouet’s home bore the marks of charity. I thanked God they gave Kelly safe harbor while studying their language and history. We deposited our suitcases in a room with private bath and bidet before Marie-Aline and Fifi led us to their gardens. I coveted their red climbing rose blooming on a terrace. Later, Aurelie, Marie-Aline’s older sister, returned from work. We partook in the French’s 9 p.m. dinner hour. They spoke of their concern for their father’s health. The next day while Kelly was in class, we learned the Parisian habit of sunning your face beside the circular basin in Luxemburg Gardens. We later met her by the garden’s Statue of Liberty to gladly learn the difference between a patisserie and a boulangerie. In the course of the week, our two capable hostesses confided their grievous estrangement from their mother and younger sister. Before we left their home and Paris, we visited Mr. Jouet, a remarkable scientist and inventor who supported his daughters with affection and trust. He succumbed to cancer within six months. Several years later, imagine my glad surprise when Kelly relayed a call from Marie-Aline with wonderful news. The Jouet sisters and their mother had reconciled and would love to celebrate Christmas with us in our home. What joy! But would they find our little place comfortable, and contentment in our quiet village of Romeo? Would they enjoy my southern-northern American table? Begin with baguettes, Nutella, and yogurt, Kelly recommended. I built my menus on that foundation. As the Jouets did us, we welcomed them as family. Mere years after our firstborn’s death, laughter and conversation filled our Christmas with charming French accents. The lone man, my husband reveled in his French-American harem and double batches of homemade Christmas cookies. We drove our two clans to Detroit for the Jouets to taste Greek Town. I observed the affection of the older sisters toward their younger. What a blessed gift to partake in the restoration of a family. According to the Jouet’s tradition, we exchanged gifts on Christmas Eve. They sang their favorite French carols before Marie-Aline suggested we go caroling. Kelly thought festive Tilson Street in Romeo might welcome carolers. My two daughters, the three French sisters, and I bundled up to sing Christmas joy to perfect strangers. From house to house, our songs carried our hope for peace to all the Earth. Dear Reader, a man who understood the dynamics of cause and effect, I believe Mr. Jouet would’ve joined us in this substantial proof of the Virgin’s birth. From what I understand, he too participated in large doses of Christian tradition. My volunteer badge clipped to my red sweater, I stand inside the Detroit Institute of Arts. A reindeer headband accents my holiday cheer. I’m happy to oblige when asked to take tickets for pictures with Santa. As a youngster, I believed in Santa Claus with all my heart. A sense of expectation swells in the queue of parents and children as Santa poses in his chair for a camera check. Oh the joy of Noel Night in downtown Detroit! Impeccably dressed in his red and white suit and bearded with his own whiskers, he utters not one “Ho! Ho! Ho!” The twinkle in his eyes says it all. This Santa embodies how I imagine the real Saint Nicholas. I’d stand still as a statue and strain my eyes and ears. Year after year, never did I doubt Dad told the truth. After all, I believed in Jesus without seeing Him. I believed Santa, Mrs. Claus, and their elves lived in the North Pole—a place like Heaven. Even when Santa didn’t eat all our cookies and drink the milk we left, I believed in his eternal return Christmas Eve. Unawares, my cousin taught me a new word. By summer’s end, my childhood innocence unraveled entirely. I knew where babies came from and Santa no longer existed. As the line for Santa thins, I observe his gentleness with the children, teens, and adults. It’s odd. I can’t remember sitting on Santa’s knee as a child. Did I ever tell him what I wanted for Christmas? Miraculously, he always left the desire of my heart under our tree. Santa looks across the spacious hall and catches my eye. He waves a gloved hand and points to his knee. I shake my head and point to the ticket box. “Iris, I’ll take tickets if you’d like a picture with Santa,” my volunteer director says. 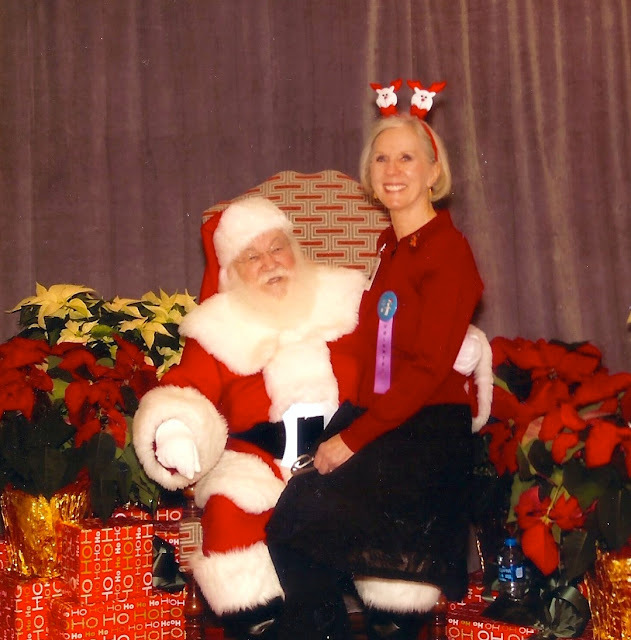 In a moment of unexpected fulfillment, I sit on Santa’s knee. We pose for our picture. Eye to eye, I spoke it. Dear Reader, I believe in the first Noel Night with all my heart. God with us. Hope of His world. They’re the epitome of shortbread. Mom called them Pecan Sandies. Every blessed Christmastime, she’d form the dry dough into small balls and bake them, the buttery scent wafting throughout the house. Then she’d roll the warm cookies in powdered sugar. A clueless kid, I munched on our decorated sugar cookies and washed them down with milk. A sophisticated baker, Mom bit into a Pecan Sandie that crumbled in her coffee. I can still see the ecstasy on her face. They’re not the only tribe who claims these foods as old molecules in their DNA. There are Russian Tea Cakes, Swedish Tea Cakes, and Mexican Wedding Cakes—cousins of the Pecan Sandie clan. I’m not a Pecan Sandie historian, but I hazard a guess Mom’s recipe is an inherited variation of Scottish shortbread. After all, Mary, Queen of Scots, is attributed to popularizing “the biscuit” in her homeland—a sweet legacy from a bitter life. I imagine Great-granny would’ve had plenty butter available to bake shortbread during long, frigid winters. Every Nineteenth Century Southern cook kept flour in her barrel for biscuits. All great-granny needed was salt and sugar to make shortbread. Nothing fancy for one of the delicate confections on the planet. My mother wasn’t sure she approved when I first offered her a Pecan Sandie with mini chocolate chips. She stood by her ingredients with a fixed lower lip. Decades later, I developed another new food molecule with one tablespoon of culinary lavender speckled throughout the dough. I promise you, if Mom could’ve smelled the aroma of baking butter, lavender, and chocolate she would’ve jigged for a taste. I recently baked a double batch of Pecan Sandies for my herb group’s cookie exchange at Seven Ponds Nature Center. I carried my contribution in the white vintage pail my mother gifted me twenty-five years ago. We celebrated an Appalachian Christmas with her that December. 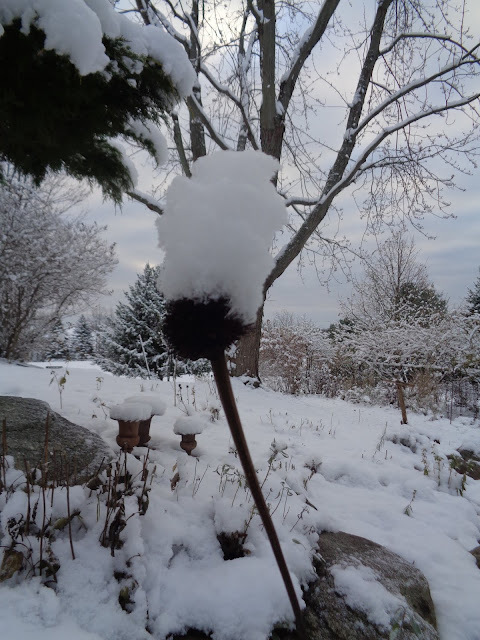 Dear Reader, I miss my mother sorely at Yuletide. I believe her Scots/German genetics would’ve eventually developed a new Pecan, Chocolate, Lavender Sandie molecule. Blend: 1-cup butter with ½ cup powdered sugar; add 1 teaspoon vanilla. Add to mixture: 1 ½ cups flour, ¼ teaspoon salt, ½ cup chopped pecans, ½ cup chocolate chips (or chopped chocolate), and 1 tablespoon culinary lavender. Bake for 12 minutes at 400 degrees on cookie sheet lined with parchment paper. Roll warm in powdered sugar. Cool thoroughly before storing. Yield: 2 ½ dozen.